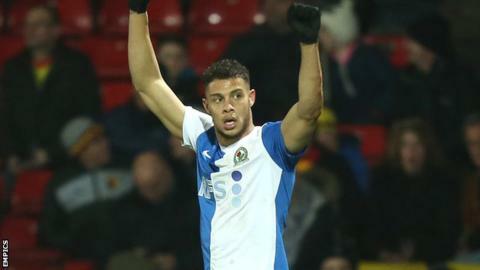 Blackburn manager Gary Bowyer has praised the impact made by striker Rudy Gestede since his arrival at the Championship club from Cardiff City. The 25-year-old has scored 10 times since joining Rovers in November. "He's been fantastic," Bowyer told BBC Radio Lancashire. "As a person, he's first class. He appreciates everything that everybody does for him. "He works hard at his game and I think he's improved a lot, but most of the credit for that has got to go to him." Gestede made his loan a permanent move in January and he is under contract at Ewood Park for another three seasons. He netted a first-half hat-trick in Monday's 4-2 win at Birmingham, a result that kept Bowyer's side in with a chance of reaching the play-offs. Record signing Jordan Rhodes contributed 27 of Blackburn's 55 league goals in 2012-13 and he is their top scorer against this term, with 24, although Benin international Gestede has been a prolific strike partner in the second half of the season. Bowyer continued: "The goals are getting shared out now, which is pleasing, and the fact that Rudy has got 10 is impressive because it takes the burden off Jordan. "We can't ignore the impact that [fellow January signing] Craig Conway has made, in open play and at set-pieces. "It must be a dream for the two lads up front because you know that when he gets it, he's putting in that spot regularly."